Study Design: Prospective single-center study. Objective: To analyze the efficacy and safety of a new technique of global vertebral correction with convex rod rotation performed on the patients with adolescent idiopathic scoliosis. Summary of Background Data: Surgical goal is to obtain an optimal curve correction in scoliosis surgery. There are various correction techniques. 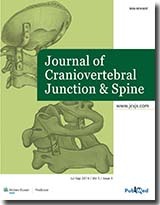 This report describes a new technique of global vertebral correction with convex rod rotation. 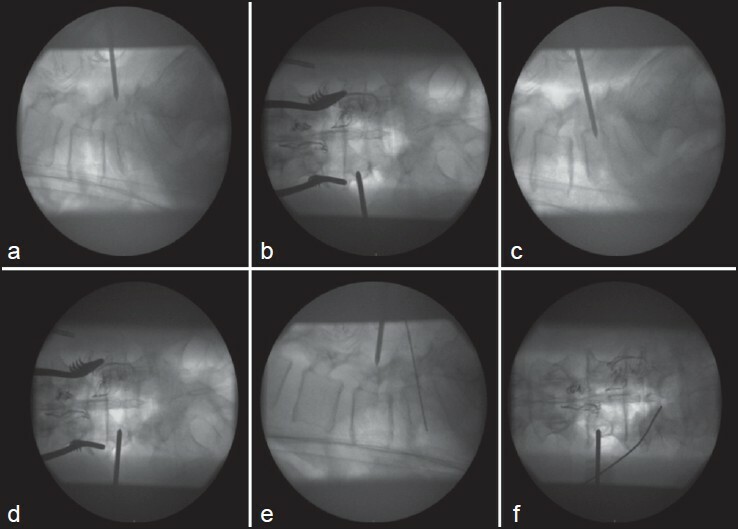 Materials and Methods: A total of 12 consecutive patients with Lenke type I adolescent idiopathic scoliosis and managed by convex rod rotation technique between years 2012 and 2013 having more than 1 year follow-up were included. Mean age was 14.5 (range = 13-17 years) years at the time of operation. The hospital charts were reviewed for demographic data. Measurements of curve magnitude and balance were made on 36-inch standing anteroposterior and lateral radiographs taken before surgery and at most recent follow up to assess deformity correction, spinal balance, and complications related to the instrumentation. Results: Preoperative coronal plane major curve of 62° (range = 50°-72°) with flexibility of less than 30% was corrected to 11.5°(range = 10°-14°) showing a 81% scoliosis correction at the final follow-up. Coronal imbalance was improved 72% at the most recent follow-up assessment. No complications were found. Conclusion: The new technique of global vertebral correction with Ucar's convex rod rotation is an effective technique. This method is a vertebral rotation procedure from convex side and it allows to put screws easily to the concave side. Objective: Jugular foramen of human skull is one of the most interesting foramina. It is a complex bony canal, numerous vital structures, including nerves and vessels are transmitted through it. Most of the intracranial and extra cranial lesions of posterior cranial fossa might affect the structures in jugular foramen in addition to intrinsic abnormalities. As the neurosurgeons have become courageous in approaching this area, so there is a need to become familiar with this area. Hence, the present study was done to examine the anatomy of jugular foramen, including its morphological features and dimensions. 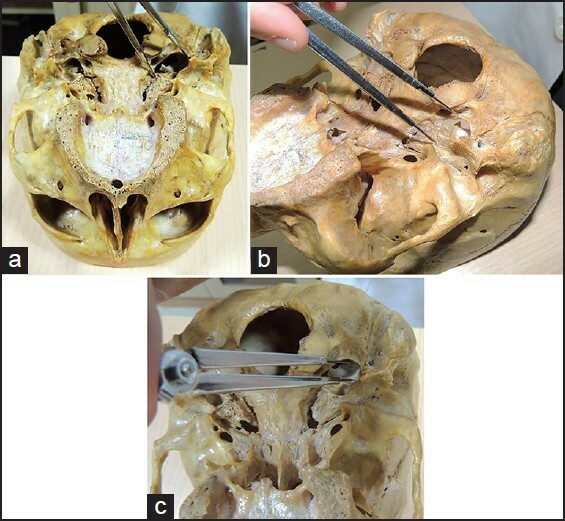 Materials and Methods: The study was carried out on 50 dried skulls. 100 jugular foramina were studied on both right and left side of skulls. The length, width of jugular foramen and width and depth of jugular fossa were measured using vernier calipers. Presence of dome, complete and incomplete septation was also looked for. Results: The mean right and left anteroposterior diameter, latero-medial diameter, area, jugular fossa width, depth in our study was 11.22, 16.52, 187.34, 6.83, 11.58 mm and 9.52, 16.02, 153.2, 5.69, 11.13 mm. 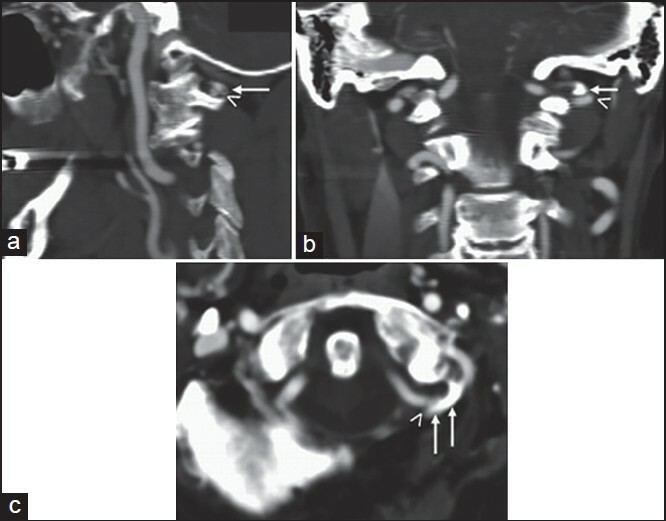 Dome was present in jugular foramen in 74% on the right side and 58% on the left side. Complete septation in jugular foramen is seen in 44% on the right side and 42% on the left side. Conclusion: This study will help the neurosurgeons while doing surgery in this region. Surgical C1C2-stabilization may be complicated by arterial-arterial embolism or arterial injury. Another potential complication is hemodynamic stroke. The latter might be induced in patients with poor posterior fossa collateralization (risk factor 1) when the vertebral artery (VA) is compressed during reduction (risk factor 2). 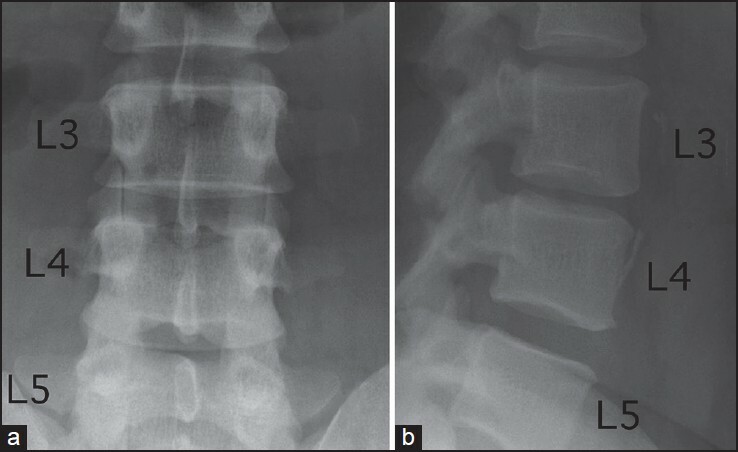 We report a clinical case where this rare situation occurred: A 72-year old patient was undergoing C1C2-stabilization for subluxation due to rheumatoid arthritis. Preoperative computed tomography angiography (CTA) had shown poor collaterals in the posterior fossa. Furthermore, intraoperative Doppler ultrasound (US) detected unilateral VA occlusion during reduction. It appeared to be a high-risk situation for hemodynamic stroke. Surgical inspection of the VA found osteofibrous compressing elements. Arterial decompression was performed resulting in the normal flow as detected by US. Subsequently, C1C2-stabilization could be realized. The clinical and radiological outcome was very favorable. In C1C2-stabilization precise analysis of preoperative CTA and intraoperative US are important to detect risk factors of hemodynamic stroke. Using these data may prevent this rare, but potentially life-threatening complication. Study Design: Retrospective study. Objective: The aim was to find out whether intraoperative three-dimensional imaging after transpedicular positioning of Kirschner wire (K-wire) in lumbar and thoracic posterior instrumentation procedures is of benefit to the patients and if this technique is accurately enough to make a postoperative screw position control through computer tomography (CT) dispensable. Patients and Methods: Lumbar and thoracic posterior instrumentation procedures conducted at our department between 2002 and 2012 were retrospectively reviewed. The patients were divided into two groups: group A, including patients who underwent intraoperative three-dimensional scan after transpedicular positioning of the K-wire and group B, including patients who underwent only intraoperative biplanar fluoroscopy. An early postoperative CT of the instrumented section was done in all cases to assess the screw position. The rate of immediate intraoperative correction of the K-wires in cases of mal-positioning, as well as the rate of postoperative screw revisions, was measured. Results: In general, 345 patients (1880 screws) were reviewed and divided into two groups; group A with 225 patients (1218 screws) and group B with 120 patients (662 screws). One patient (0.44%) (one screw [0.082%]) of group A underwent postoperative screw correction while screw revisions were necessary in 14 patients (11.7%) (28 screws [4.2%]) of group B. Twenty-three patients (10.2%) (28 K-wires [2.3%]) of group A underwent intraoperative correction due to primary intraoperative detected K-wire mal-position. None of the corrected K-wires resulted in a corresponding neurological deficit. Conclusion: Three-dimensional imaging after transpedicular K-wire positioning leads to solid intraoperative identification of misplaced K-wires prior to screw placement and reduces screw revision rates compared with conventional fluoroscopic control. When no clinical deterioration emerges, a postoperative CT seems to be dispensable using this intraoperative three-dimensional control method. The identification of a soft tissue chondroma within the spine represents a rarity and is typically not included within the differential diagnosis for patients with sensory complaints of the leg. The authors describe 46-year-old female presenting with 3-week history of decreased sensation and paresthesias of the left leg. Magnetic resonance imaging of the lumbar spine demonstrated an L3 extradural soft tissue mass. 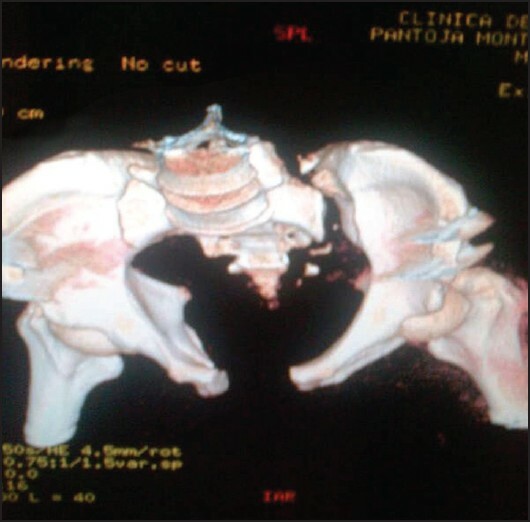 She underwent an uncomplicated excision through an L3 laminectomy and exhibited complete resolution of symptoms. Pathologic examination revealed benign cartilaginous tissue; however, the authors recommend long-term follow-up for such lesions as the potential for malignant transformation is unknown. A 53-year-old male patient presented with low back pain radiating to both lower limbs for 2 years and urinary incontinence for 2 months. He had swelled over his lower back since birth. The neurological examination revealed a decreased perianal sensation. Local examination of the lumbar swelling showed a brilliantly transilluminant, cystic midline swelling in the lumbar area with underlying spina bifida. Magnetic resonance imaging revealed a low-lying conus at L3 level associated with spina bifida at L5 and a meningocoele sac. The patient underwent excision of the meningocoele and detethering of cord by extirpation of hypertrophied filum terminale. The patient had an immediate relief of his symptoms. At 3 month follow-up the lumbar wound had healed well, and there was a significant improvement in the perianal hypoesthesia. The adult presentation of a congenital meningocoele and spinal dysraphism is rare, especially in the fifth decade. The possible causes of this delayed presentation are analyzed, and the relevant literature on the subject is presented. Glycogenosis II (GSDII) is an autosomal recessive lysosomal storage disorder resulting from deficiency of acid alpha-glucosidase and subsequent lysosomal accumulation of glycogen in skeletal, cardiac and smooth muscles. The late-onset form is characterized by wide variability of the phenotypical spectrum. Clinical findings may include muscle weakness, respiratory insufficiency, vascular abnormalities, low bone mineral density and higher risk of developing osteoporosis. Craniovertebral junction (CVJ) malformations have never been described so far. We here report on a GSDII 43-year-old woman who harbored the mutations IVS1-13T>G and c.2237G>A in the acid alpha-glucosidase gene. She recurrently suffered from headache, neck pain and dizziness. Brain MRI and CT scan showed the presence of a very rare complex CVJ malformation composed of basilar invagination, basiocciput hypoplasia, partial C1 assimilation, C1 posterior arch aplasia and C1 lateral mass hypoplasia and offset. Although we cannot rule out their coincidental occurrence, the rarity of multiple CVJ malformations in the general population as well as the well-known GSDII multisystem involvement should suggest to study the CVJ in the diagnostic process of GSDII patients in order to assess the CVJ malformation frequency in GSDII population and verify a possible relationship between these two conditions.